...a new project with the Winterkist gnoma! You had to see that coming, right? My sewing machine broke as I was finishing the last advent calendar order, and kind of pulled the calendar up into the machine. I was absolutely distraught at this point, but I contacted the customer as soon as it happened and explained that I'd no longer be able to guarantee a December 1st delivery, so I'd refund her money. She was incredibly nice about it and said that her family had planned to use the calendar as a second advent calendar with which to do good deeds throughout the holiday season. Like, sing carols at a nursing home, etc. What a great idea, right?! So they didn't really need my version, but her kids had really fallen in love with the gnoma [and who wouldn't, he's so cute]. I emailed her back and offered to make up a different idea: a stuffed Santa gnoma that would have a single pocket that could be filled with a little note indicating the daily good deed. Since he would be more like a stuffed animal, he would be portable and could take turns "living" with each kid in turn. While the pocket is a little crooked, it's not as bad as it appears to be in the picture...gnoma doesn't stand up straight! So since my machine is out of order at the moment, this little guy was entirely hand-sewn. 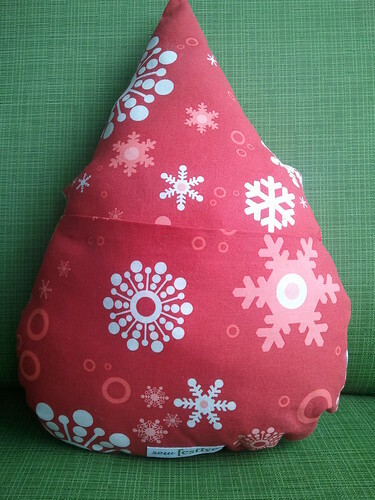 The pocket edges are folded down and secured with fusible bonding. 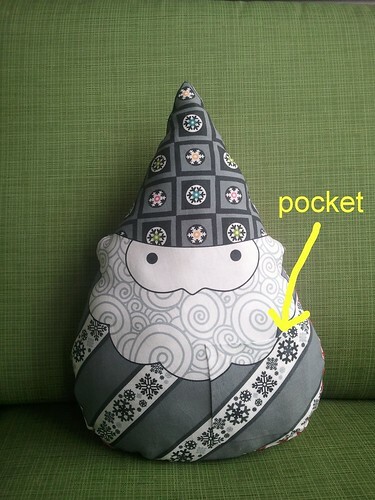 The front pocket is made out of a second large gnoma and placed so that it's almost perfectly aligned. The back pocket was something I added in the midst of making it, in case they want larger items like song lyrics or stories to be able to be tucked into this gnoma. He was stuffed with fluffy innards and stitched closed. He measures almost 15" tall and will hopefully be well-loved! Sorry that your machine is out of order (hopefully it will be up and running soon!) 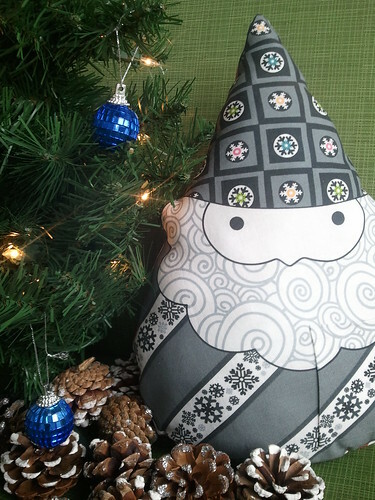 Adorable idea for the Santa gnome...bet they love it! !